The past catches up with me! 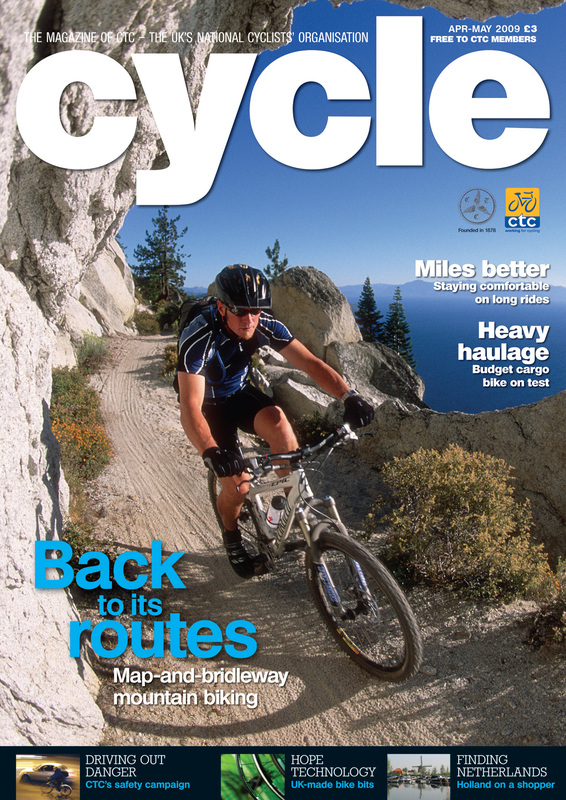 The bimonthly Cycle Magazine landed on our doormat last week. This is the principal publication of the Cyclists’ Touring Club (CTC), the largest national organisation in the country representing the interests of cyclists like me. For me, the magazine is compulsive reading; not a magazine that I dip into like a buffet spread, but one that has multiple a la carte dishes that I ‘eat’ my way through methodically, looking forward to the ‘desert and coffee’ at the end. With pen in hand, I underline, circle and make margin notes against things that I need to re-visit when the leisurely read from cover-to-cover is over. Some of the items need some kind of immediate action (eg. the transfer of dates to the diary), others need investigating further (eg product reviews), and others simply merit a second read (especially the well written articles on adventurous expeditions around the world). It took me the best part of a week to meander through the 84 pages until I got to the last section entitled Travellers’ Tales, a section where readers can submit a short, pithy account of some major cycling experience they have recently enjoyed. 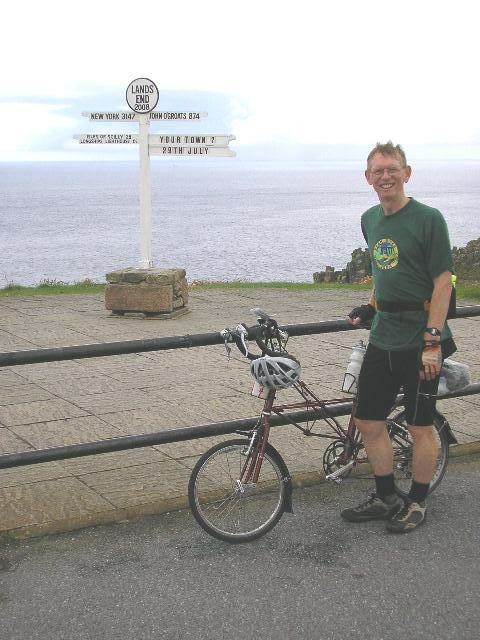 In this edition, the section was dedicated to the famous and well-travelled LEJOG (Land’s End to John O’Groats), a 1000 mile route that will challenge even the most experienced cyclist. 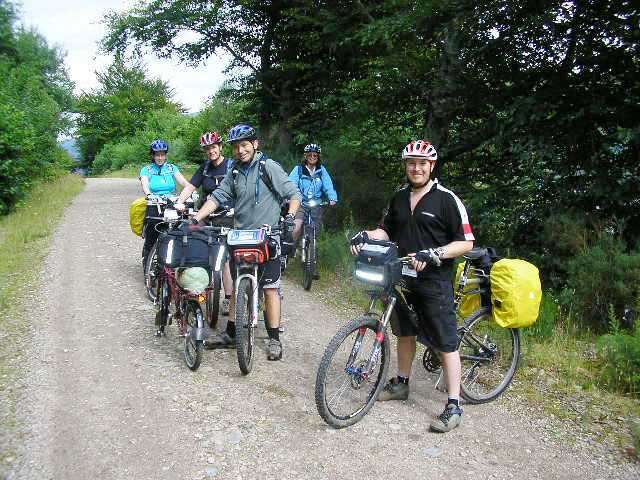 The first article described the experience of a blind ‘stoker’ riding on the back of a tandem captained by a sighted rider. The second was written by a couple of newly-weds who decided to spend their honeymoon riding from north to south. The third, entitled End to End at 80, was an astonishing account of 80 year old Clive Williams, who had not only completed the distance, but had done so in only two weeks, averaging about 70 miles per day. Then, as I began reading the last account, entitled Riding into retirement, I suddenly had a feeling of deja vu. I read the first few lines, looked at the two small photos, looked for the credits………………. and you could have knocked me over with a feather! I was actually reading about my own End to End ride completed back in July 2008, just a few days after my retirement from teaching. This was an article I had submitted over three years ago, and it was only now seeing the light of day! Is this an example of ‘good things happening to those who wait’? frame, suspension front and rear, and more than adequate gearing, made this a perfect long-distance machine, and one that can be separated into two halves, bagged and carried onto trains as hand-luggage. The journey to Penzance by train was straightforward. A train steward even helped me with my bagged bike and lifted it onto the overhead luggage rack for me! 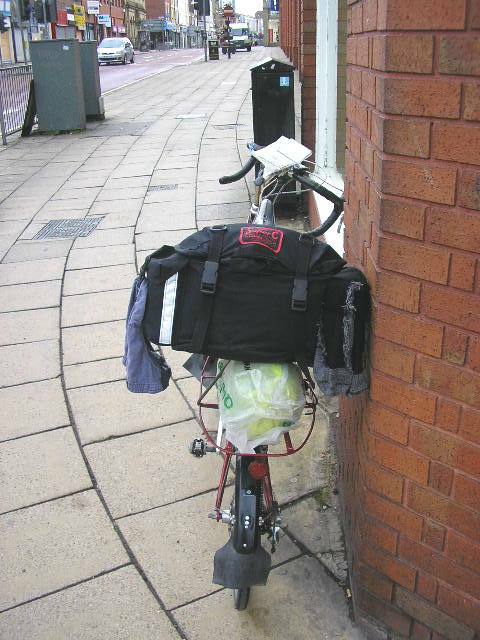 Proof that a bagged Moulton passes as hand-luggage? Later, as I built up the bike on Penzance station, I noticed from the corner of my eye another Moulton and rider alighting, fully assembled, loaded and ready to go. He obviously had managed to reserve bike space, and now he was off, first out of the blocks. I felt a little cheated! 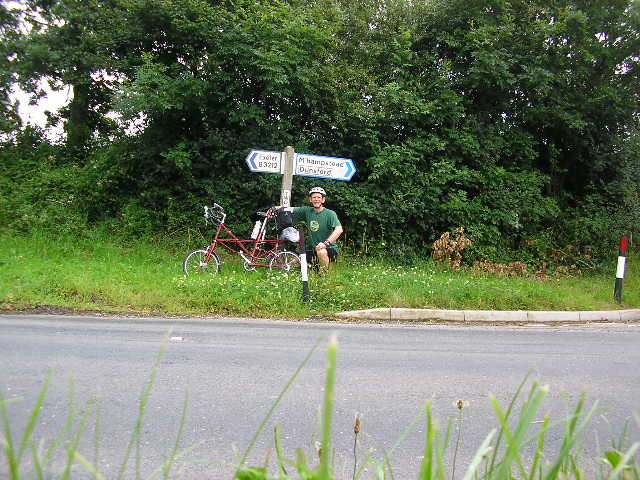 On the short 10 mile hop to St Just YH, I passed him going in the opposite direction, and realised he was probably another LEJOG rider who had quickly visited Lands End, had the obligatory photo taken with the signposts, and had made a quick start on the route. We waved to each other across a busy road, and wondered if our two Moultons would become acquainted up the road. Due to my late arrival and the absence of shops, the warden at the YH took pity on me and gave me a couple of packets of noodles and fruit for my supper. That night, I pitched my little bivvy-tent in their garden, only to be driven indoors at 3am when a thunderstorm threatened. I slept on a sofa and was awoken by the warden when she started preparing breakfast. I scurried down to the End, tried to take photos of myself with signposts (optimistically declaring JOG to be 874 miles away, but I knew better!) on self-timer, but the resident photographer offered to do it for me with my camera. Wonder how long he will stay in business? At Leedstown I am alerted by a café owner that a cyclist with an identical bike to mine is about 15 minutes ahead of me. Sure enough, I caught up with him in Redruth. A German gentleman called Peter Kafke, who demonstrated that the Moulton can carry twice its own weight in luggage. He looks at my meagre burden and wonders if he might be carrying too much! Anyway, he’s in no hurry to get to JOG. He has allowed five weeks for the journey. We shared a light lunch together in a local café, and swapped email addresses. I decided to motor on and pack in a few miles on the first day, to give me an early feeling of good progress. By 8pm I needed somewhere to pitch my little bivvy-tent, but a caravan site wanted to charge me £20 (same price as a caravan! ), so I continued to Tavistock and found a secluded corner of the local park. That night, however, the heavens emptied their entire contents on my tent, which filled up with water and drove me out before dawn. Everything was soaked through, and I emptied an inch of water from the tent. I threw away the tent (why carry it wet all the way to JOG? 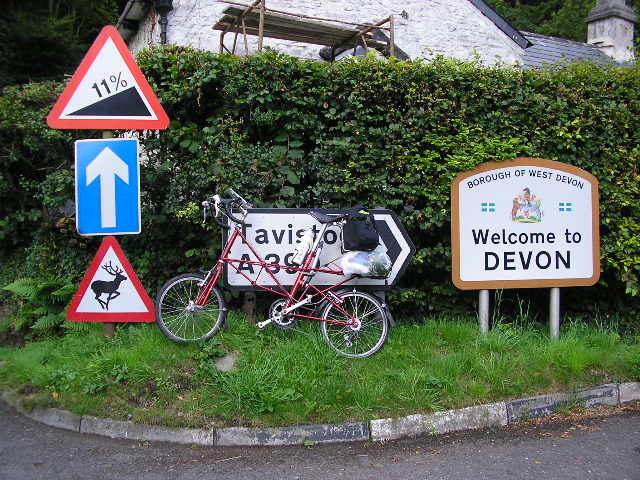 ), spent an hour in the local launderette feeding coins to a tumble dryer, stoked up on a hearty breakfast, and began the long climb over Dartmoor. The first 10 miles were appallingly wet and misty, but then the rain eased off making the climb over Dartmoor much more pleasant than I had feared. The mist, unfortunately, enveloped the beautiful wilderness, but then it gave it the dramatic effect so reminiscent of Daphne du Maurier’s novels. A refuelling stop in Exeter stoked me up for the long haul up to Taunton, but delighted to note that the expected south westerly continued to assist my progress. Now tentless, I had to look for a bed in Taunton, which even on a quiet day cannot boast many offerings. Somerset people suffer the indignity of seeing floods of tourists passing through their county on their way to Devon and Cornwall, but very few stay. Hence the lack of B&Bs. But to make a difficult situation impossible for this lone cyclist, my passage coincided with a cricket festival, so every available bed happened to be occupied anyway. This meant heading out of Taunton, up into the Quantocks for some unprogrammed extra hill-climbing, until I found an isolated farmhouse that could oblige. It did mean, however, that the start of my ride the following day would entail downhill! Of course, serious downhilling first thing on a chilly morning means getting very cold, so it took me a few miles to thaw out. 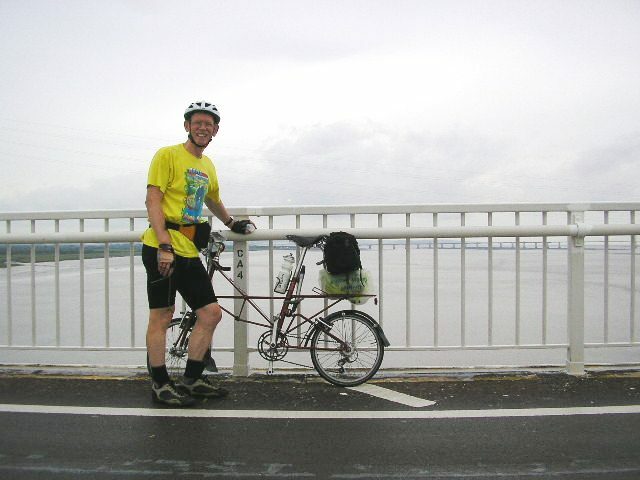 The forecast was dismal again, but I only caught the odd shower as I scooted across the Somerset Levels (yes, flat! ), through Cheddar and across the Mendip Hills to Avonmouth. I could see the Avon Bridge looming large long before I arrived, as I could the Severn Road Bridge. Both these bridges are amazing feats of engineering, which can be much better appreciated if you cross either as a cyclist or pedestrian. If you haven’t done either, I would heartily recommend it. When the wind blows, you feel totally exposed. When the sun is shining, the views are dramatic. 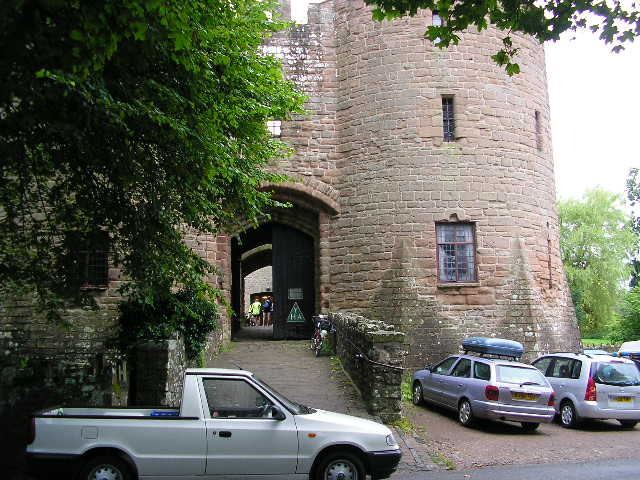 I stayed the night at St Briavels Castle, which is a Youth Hostel. My gold life-membership card seemed to garner attention with the warden, and he offered to book my next bed at Bridges YH in Shropshire. St Briavels offers a unique chance to stay at a Norman Castle, built as a hunting lodge for King John in 1205, set in the heart of the Forest of Dean. I was allocated the “Hanging Room” and am delighted to say that my sleep was not interrupted by any former malign events that took place in that part of the Castle. The cycle shed key was attached to a plastic mug in the hope that a user would not inadvertently slip it into a pocket and disappear with it up the road. Throughout the rest of my journey, I was to find an interesting variety of attachments to cycle store keys. A couple of LEJOG ladies arrived late that evening, having failed to make it to Welsh Bicknor, but they felt confident they could make up the deficit. I was not to meet them again until JOG, when they arrived two days after me. I discovered an obvious truth today: “A” roads are not necessarily busy roads. In fact, the longer the number after “A”, the quieter the road will be. For example, the A4110 north of Hereford is really a “B” road in all but name. So today, much of my time was spent on quiet border “A” and “B” roads, cycling through some of the most delightful pastoral landscapes you could imagine, culminating in a passage through places with evocative names, such as Aymestry, Clungunford, Twitchen and Clunbury. I’m sure these names all have a local significance, and my imagination plays games with possibilities. which is now Bridges YH. My memory of this hostel several years ago was of a very basically furnished building, with cold showers and doubtful plumbing. Today, it is a very tastefully refurbished place, that is (with its culinary offerings) particularly welcoming to vegetarians. I enjoyed a huge plate of vegetable curry for supper, and in the table conversation with other hostellers, met a stained glass window artist who had repaired several church windows in villages close to my home. It was fascinating to hear his story. Cycle store key was, this time, attached to a pedal crank! Bridges YH is located next to a babbling brook, and in the beautiful morning sunshine, it was hard to pull myself away to begin what I knew would be a hard day’s cycling. My intention was to carve my way through the corridor between Merseyside on my left, and Greater Manchester on my right, and extract myself as quickly as possible from the endless conurbations. The ride began with a breathtaking descent from the heather-covered Long Mynd, taking a wide sweep around Shrewsbury towards Wem, Whitchurch, Warrington and Wigan (a day of alliteration!) To my surprise, these urban areas were not quite the jungles I had feared, and the traffic was lighter than I had expected. 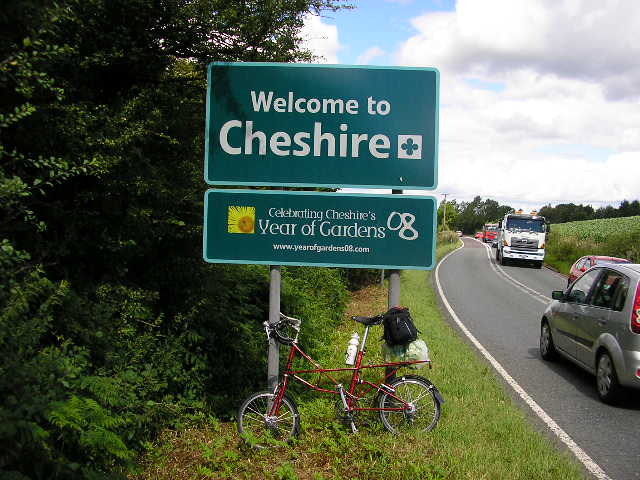 I swept through Cheshire and into Lancashire feeling the momentum of the experience. Arriving in Preston, I had to find accommodation. I decided to go straight to the Police Station (for advice, of course, not an empty cell!) but the officer in charge told me the only hostel in town was for down-and-outs. He didn’t think I qualified, despite my bedraggled state. After many enquiries, I reckon I bagged the very last empty bed in town, at the Station Hotel. I managed to get into the dining room before the food servery closed, and later slumped on my bed to watch Bridget Jones’s Diary. There are so many entertaining imponderables in that film that it proved the perfect antidote to nearly 10 hours in the saddle. When I was told that for breakfast I should simply serve myself, I didn’t realise that actually meant cooking my own! There were mysterious implements for preparing omelettes and poaching eggs in the microwave. to the saddle bag for drying, and headed out of town, making directly towards Lancaster. I was approaching familiar territory, since I had spent two years doing post-graduate research at Lancaster University. 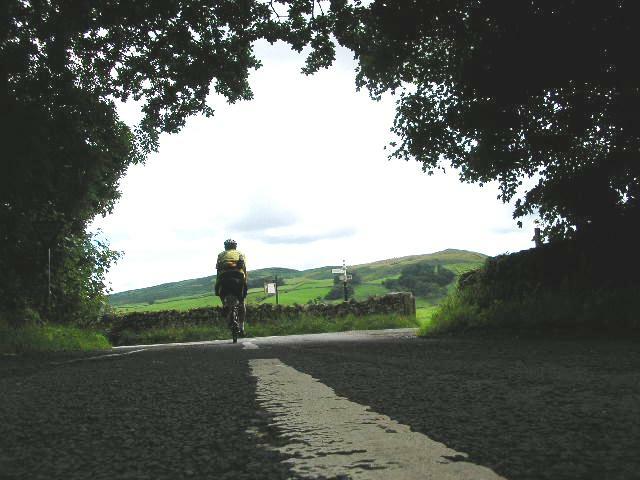 It was here, in fact, that my interest in cycling really began to form, through a combination of commuting from Morecambe on a daily basis, and the occasional sortie into the Forest of Bowland. So my cycling life was coming full circle as I headed north. food and shelter to stranded travellers in bad weather”. I imagine these guarded words hide the real extent of the challenges faced by motorists. As I descended towards the village of Shap, I wondered what the death and injury toll had been over the years. Just before Penrith, I had reached the 500 mile mark (800 kms on my computer) approximately half my journey now completed. When I looked at the map and pondered the distance already covered, I was puzzled at the apparent discrepancy with what remained to reach JOG. Surely it couldn’t be another 500+ miles to the top? It seemed so much closer to Penrith than Lands End. I rationalised this by reminding myself that roads in Scotland do not go in straight lines. They negotiate lochs and mountains, and you accept that sometimes you have to cycle away from your target in order to reach it. Sounds dumb, I know, but it’s true. Painfully true sometimes! My goal was to reach Carlisle and stay in the YH, which turned out to be a student hall of residence located in the former Carlisle Brewery, and now used as a youth hostel for the summer months. Curiously, everyone was allocated a study bedroom, and for one night at least, I re-lived some of the memories of my student days. In the shared kitchen I met a couple of men who were walking Hadrian’s Wall in sections. They used the shuttle bus to get them to and from their starting/finishing points each day. I resolved to cycle the route one day, taking in the Roman forts on the way. Crossing the border into Scotland at Gretna was another key milestone. It really felt the end was nigh, despite there being over 480 miles still to cover. Curiously, Gretna Green is still a favourite place to tie the knot, hosting multiple weddings most weekends of the year. Along the coast road to Annan, I surprisingly keep pace with a couple of chaps on their lightweight road bikes (and me on a Moulton carrying luggage! ), probably local club riders out for a spin. However, I was to meet them the following day and discover the truth. This beautiful coastal route wends its way towards Dumfries, but I was stopped short by a roadside scene that deeply saddened me. 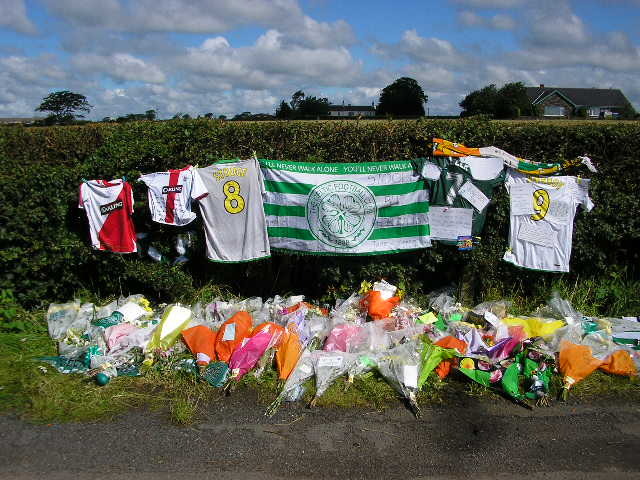 There was a huge display of wreaths and tributes to a lad named Stooge, who had died in an accident a few days previously at the age of 24. A local cyclist arrived while I was reading the tributes (many of which were written in SMS language, laced with well-meaning expletives that somehow didn’t seem out of place) and he told me that Stooge had taken a tumble from his quad bike and broken his neck. The funeral was to be the following day. 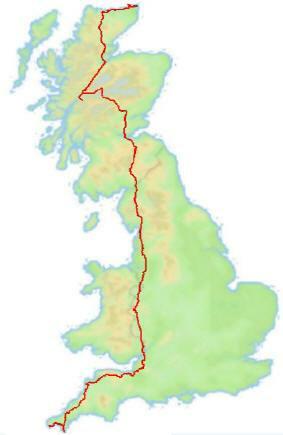 From Dumfries, the route took me along the valley of Cairn Water and into the forests of the Southern Uplands. 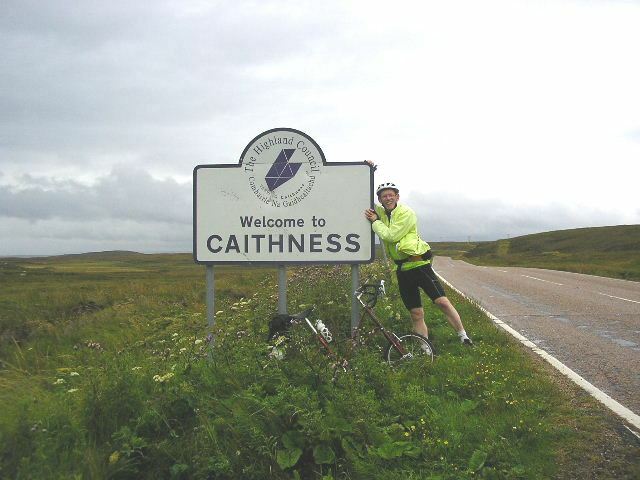 I met a couple cycling in the same direction that had attempted LEJOG last year, but had run out of time when they got to the Scottish border. 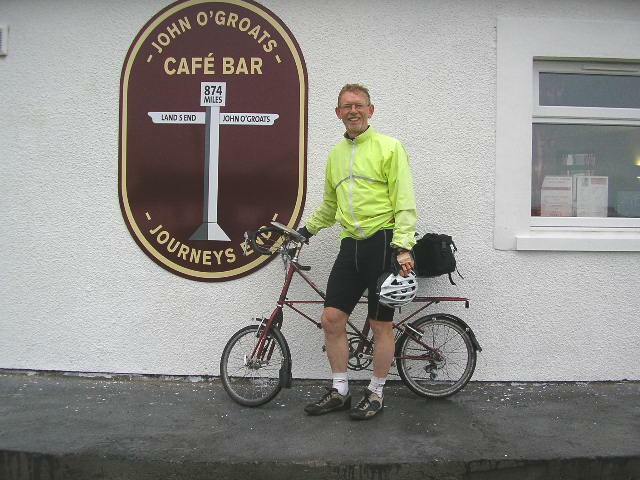 They were now completing their route in easy stages from Gretna, taking in some of the islands in the west. 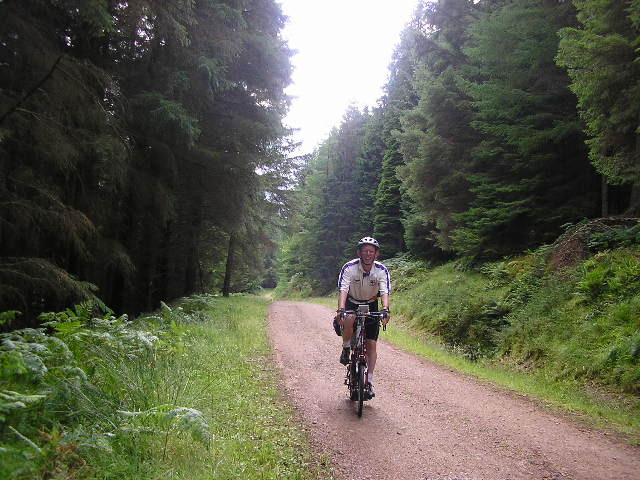 Before arriving at Kendoon YH, I noticed a wobble coming from the back wheel. On inspection, I discovered a large bulge in my back tyre which gave me cause for concern. I reckoned a nasty pothole had caused the mischief, and not carrying a spare tyre, I was going to need to visit a cycle dealer who could provide me with 20 x 1.25 tyre. I was to discover this size is not readily available, so had to settle for a 1.75, and accept the extra drag on the last leg to JOG. 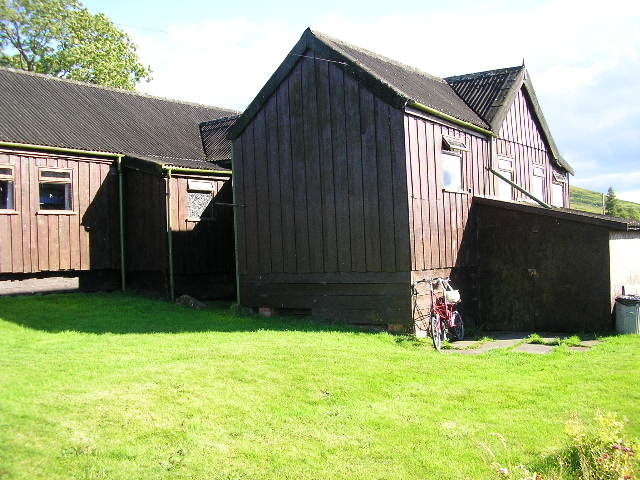 Kendoon YH looks like a large scout hut, a wooden building providing simple but very friendly accommodation, with stunning views of the Glenkens. LEJOGers. He was used to dealing with problems like mine, suggesting I had a snack in the café next door while he sorted it out. It wasn’t just the tyre he fixed, but he did all those niggling necessary adjustments to gears and brakes that you often ignore while forging ahead to your goal. I felt a new sense of confidence in my steed as I cycled away. “Fair fa’ your honest sonsie face, Great chieftain o’ the puddin’ race……………”. Ayrshire was the birthplace of the national bard, and it was in Tarbolton that Burns helped set up a debating society (the Bachelors’ Club) and where he joined the Masons. 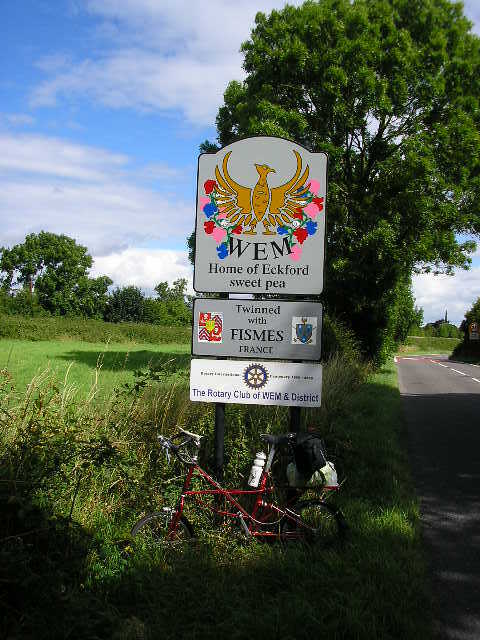 It was also here that I met up again with the two chaps on lightweight road bikes who stopped to chat and, guessing that I was doing LEJOG, asked me when I had started. When I said that it was 7 days ago, they revealed they were doing the same, but had started 11 days ago. When I enquired about their lack of luggage, they sheepishly revealed they had a support vehicle. “A sensible option” I hesitatingly suggested as I headed off up the road! They were treating each day’s ride like a Sunday morning club run. 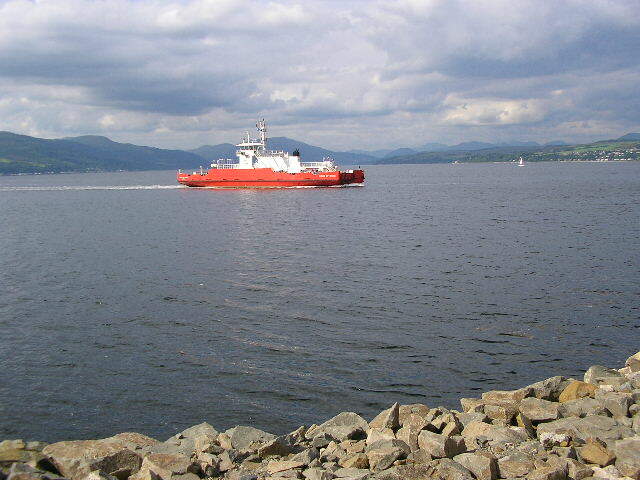 The A78 to Gourack took me to a short ferry crossing to Dunoon, where I found a B&B at a reasonable price. mussel beds), and through the historic town of Inveraray. 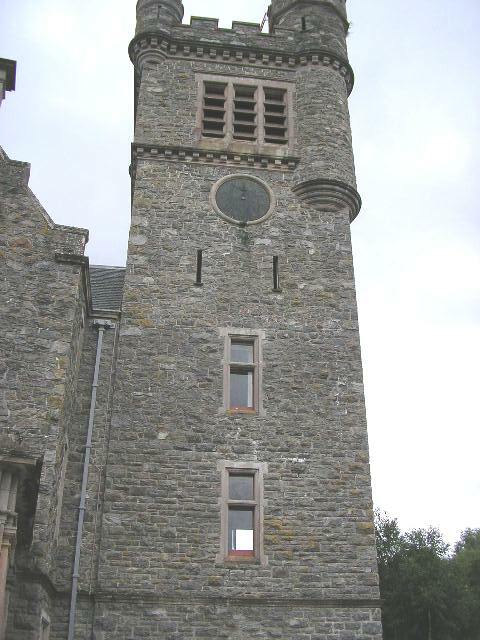 Here you will discover its Castle, stronghold of the renowned Campbell family, and its famous jail, where you can experience what it’s like to be locked up as a prisoner. 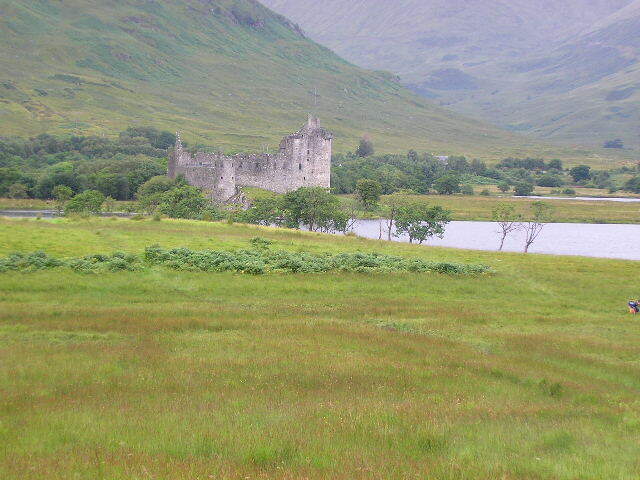 The A819 took me to Loch Awe with its famous Kilchurn Castle, situated out on a small island, largely destroyed by Royalists during the Civil War. Scottish Power’s hydro-electric visitor centre. I spent a fascinating half hour discovering the magnitude of the project to harness the power of water. 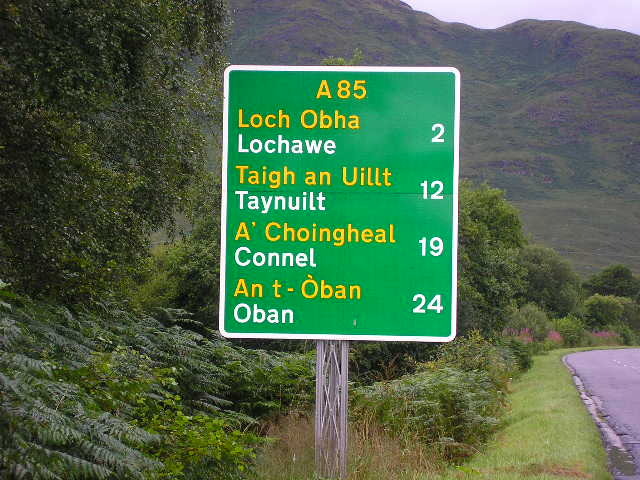 It was at this point I noticed the new road signs in the west of Scotland, which bear both the native Gaelic as well as English. 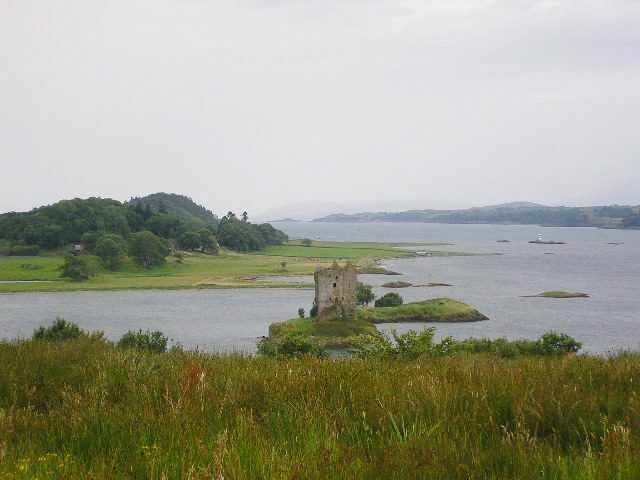 As I continued through Scotland, different regions were at odds as to whether this was desirable, especially in the eastern counties where, if anything, ancient Norse (not Gaelic) was the native language of old. 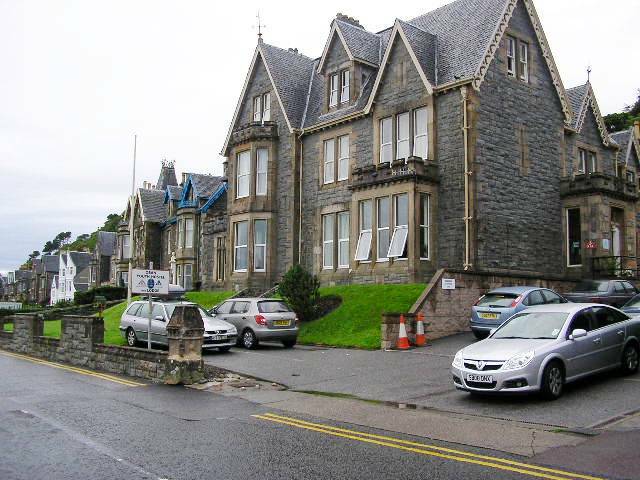 I spent the night at Oban YH, where the wardens kindly helped me to book beds in all the remaining hostels on my itinerary, thus freeing me up from the daily concern of where I was going to spend each night. Oban YH where I met the mad monk! My evening was made memorable by meeting a friendly Spanish couple who were ornithologists, but negatively so by crossing the path of the “mad monk”, a larger than life character dressed like a medieval pilgrim, but well able to verbally abuse me (in less than sanctimonious language) when he discovered I had “nicked” his bed. The wardens were profusely apologetic to me and asked me if I didn’t mind appeasing this gentleman by accepting another bed. That was no problem to me, but I knew that the wardens had had a few bad days with the mad monk, and were hoping he would move on. He did, and they breathed a sigh of relief. 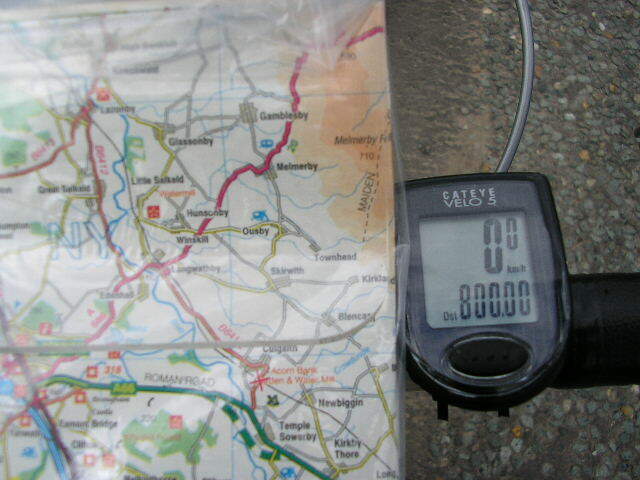 was averaging about 140 miles per day, and reckoned his average speed was about 19mph. When he described his itinerary, I didn’t have the heart to suggest that his cycle computer might be calibrated in kms! heavily on the free supplies. There are nearly always bags of pasta, noodles or rice that can make up at least an adequate plateful to keep the wolf from the door. I discovered an alternative route that followed the Great Glen Way (a forest track) and a canal tow path. This route took me all the way to Fort Augustus, skirting the edges of Loch Lochy, and giving fine views of the mist enshrouded Ben Nevis. I met a group of off-roaders in the forest who couldn’t believe that an End-to-Ender was so far off the beaten track, and he was doing it on what looked like a shopping bike! The YH at Loch Ness is perfectly situated right on the banks of the Loch, until you discover that also happens to be the favourite location for the infamous Scottish midge! You either take evasive action (i.e. stay indoors) or you smother yourself in insect repellent. Since I didn’t carry any of the latter, you can guess what I did. There was, however, the little complication of having to mend a puncture before the morrow’s ride. 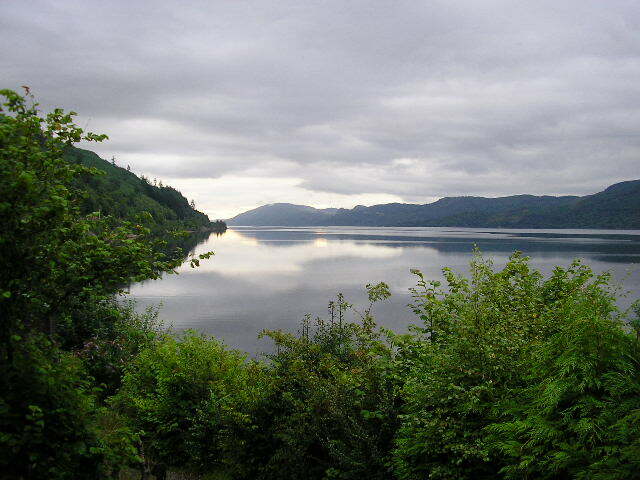 However, waking up in the morning to this stunning view of Loch Ness was a real bonus. 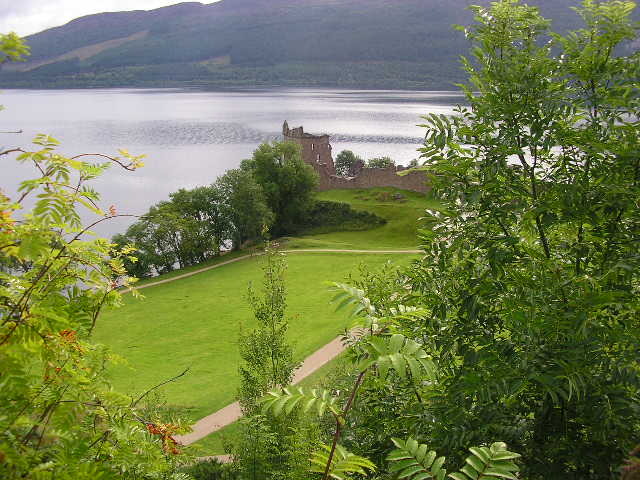 My brief stop to admire the views of Urquhart Castle confirmed my suspicion that half the population of Spain had migrated to Scotland for the summer months. Everywhere I went I met groups of Spaniards, most dumbfounded when they met someone who spoke their language! The ride through Glen Convinth took me through Beauly, Muir of Ord and Dingwall, where I found a quieter alternative route that climbed up by Foulis Castle to give me fine views of the Cromarty Firth. 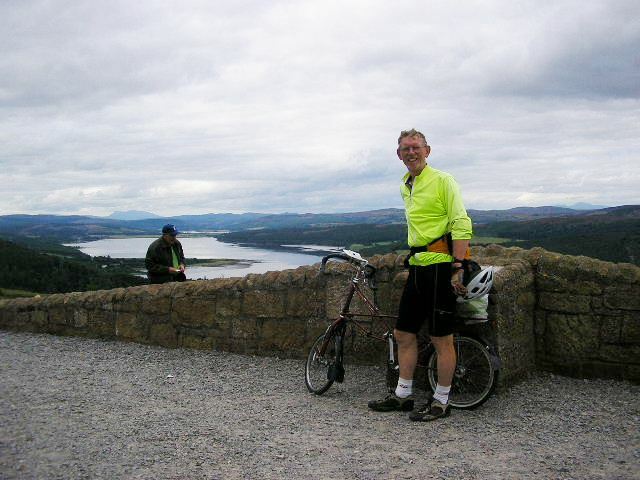 The bridge over Cromarty was the last Firth Bridge to be built in 1991, which significantly reduced the shortest distance of LEJOG, and certainly influenced the achievement of the current cycling record of just over 41 hours. Memories of my 1982 expedition kept flooding back, and the many incidents that inevitably occur when you have a group of 6 cyclists covering over 1000 miles. Before dropping down to the Dornoch Firth, I had to deal with another puncture in the back wheel, but this was to prove to be my last. And it gave the opportunity to relax a little and eat my first wild raspberries by the roadside. Conference” during the WW2, which ensured the Russians would return occupied Norwegian territory to its rightful owners. 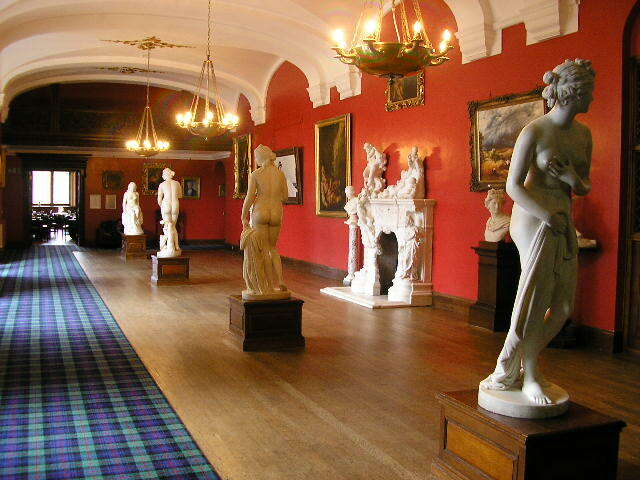 The Castle is still bedecked with marble statues, important works of art, sweeping staircases and verandas with commanding views of the Kyle of Sutherland. 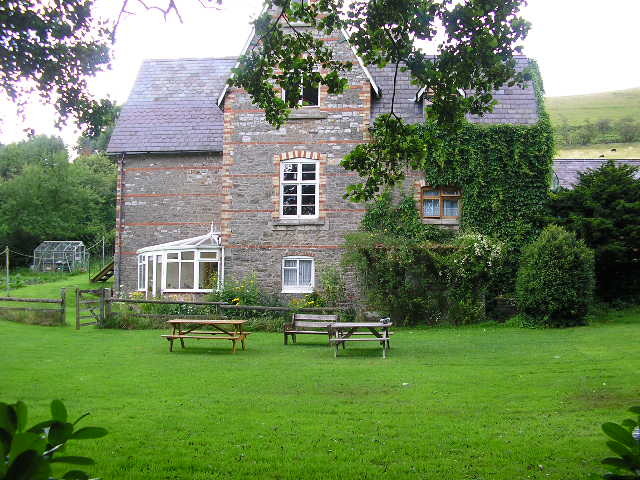 You can stay in these sumptuous surroundings for the modest cost of a hostel bed! Feeding off the current Olympic spirit, this was the day I was going for “gold”. Whatever the weather conditions, I was going to persevere to the finishing post. Little did I realise what perseverance was going to be needed. 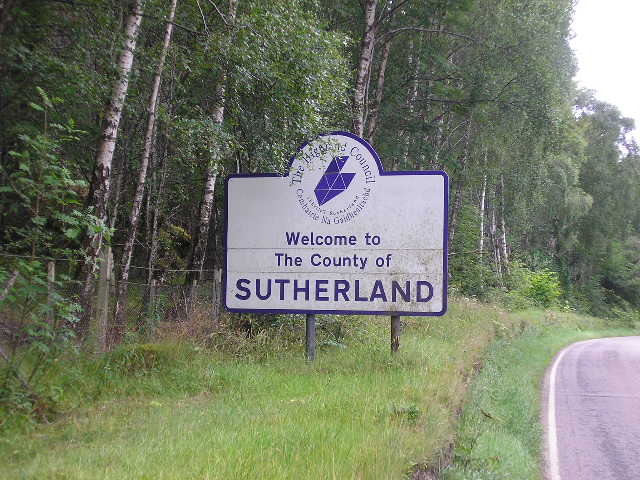 I had decided to avoid the A9 coastal route in favour of the wild, unpopulated crossing of the Sutherland Flow. It is one of the few genuine wildernesses left in the UK and, apart from the lonely Crask Inn situated high up on the bleak moorland, it would be a stretch of 50 miles without any source of supplies. So I made sure I had plenty of water, fruit cake and chocolate. 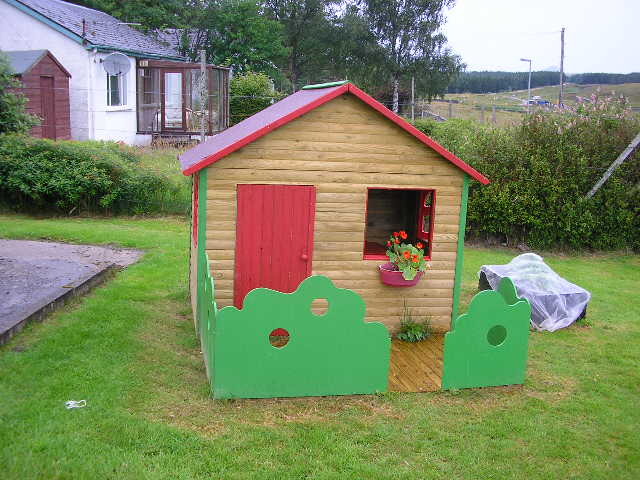 The Wendy house that saved me! between two “A” roads (albeit single-track) I had hoped to find some shelter at least, if not a little shop or cafe. But no, absolutely nothing. So desperate was I to get out of the wind and rain that I resorted to crawling into a little Wendy house in the Primary School playground. Oh, and it was so warm and dry in there! I was sad to have to drag myself out and continue the journey. How fortunate it was the school holiday, and no angry children or head teacher to contend with! the River Naver down to the coast. It was a delight to know that I was following the river downstream! However, my arrival at Bettyhill, where the road turned east and followed the coast for 55 miles to JOG, was where I met my nadir. The 40mph wind was blowing from the east, and the rain was directly in my face (and if you wear glasses, you know what that means!). Not only that, the Sutherland stretch of road up to Melvich was going to be very hilly. I dug in for what was going to be several hours of pain and suffering, and it hurt big time! Arriving at Melvich, I allowed a local inn to lure me inside, where I met a couple of cycling ladies who were also taking refuge. 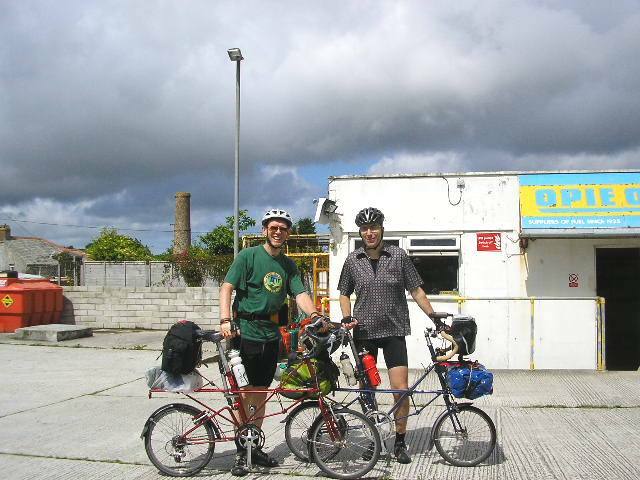 From Swansea both, they were spending 3 weeks cycling from Gretna to JOG, taking in the highlands and islands en route. When they saw my Moulton, they were so surprised one of them exclaimed “it’s one of those weird bikes!” and had to take a picture for their journal. 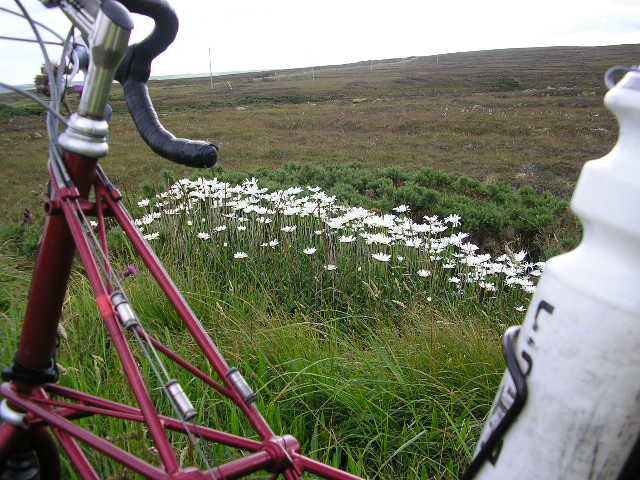 Amazingly, the rain had eased when we resumed pedalling, but sadly the wind remained. The landscape in Caithness levelled out, and the pastoral feel of the countryside contrasted starkly with the windswept wilds of Sutherland. Settling into my room, I encountered a youth leader who had been cycling the distance with four members of his youth club, all aged about 14 yrs. Again, it reminded me of my 1982 expedition, and I effusively congratulated the whole group for making it. They thought it was really cool to be congratulated by a stranger! commissioned for the building of the sea barriers to keep out enemy submarines. 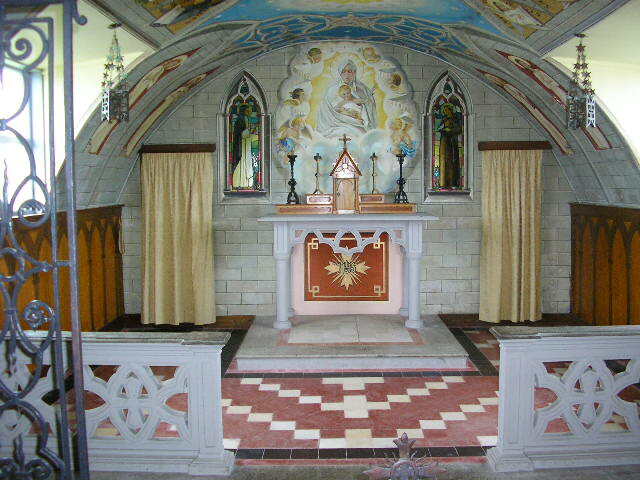 The chapel is now a preserved monument and is visited by tens of thousands of people every year, including many Italians who arrive in their motor homes. Another trip took me along the coast of Caithness to Dunnet Head, the most northerly point of the UK mainland. It happened to be a fine day (amazingly!) and the views were dramatic, not only of the coastline towards Cape Wrath in the west, but also of the Orkneys to the north, and especially of the Old Man of Hoy, a favourite challenge for elite climbers who not only have to tackle a precipitous climb, but also have to contend with the hissing and spitting gulls who will fearlessly defend their nesting sites. James IV in the 15th century to run a ferry service to the Orkneys. The account of the octagonal house and dining table, and his quest to tame his seven unruly sons, is straight out of a story book. 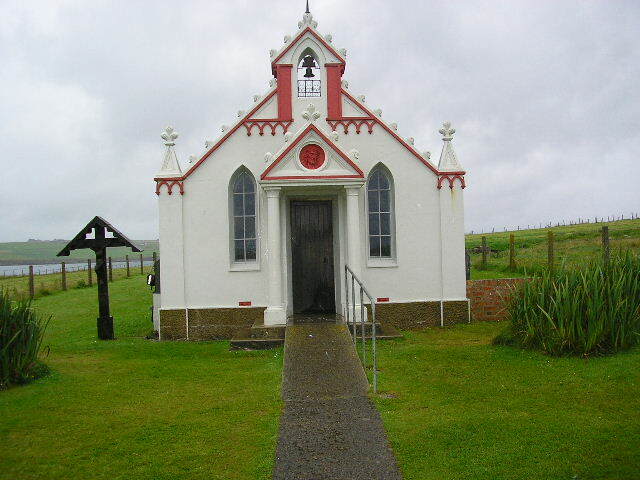 He is buried at Canisbay Kirk, in the same village where the YH is situated. 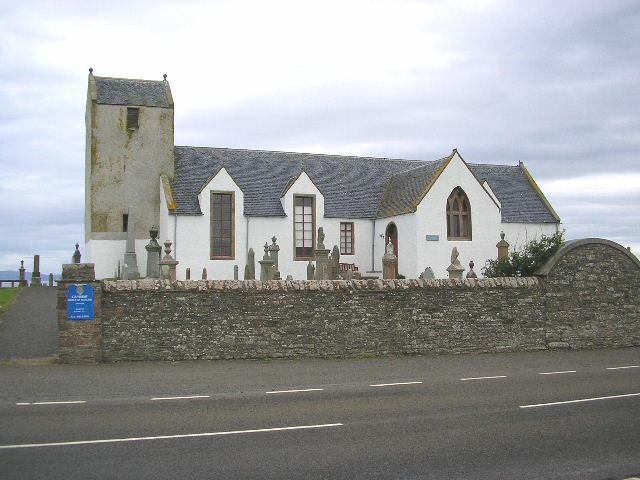 Also, Canisbay Kirk is where the late Queen Mother used to worship when she was in residence at the Castle of Mey, just 4 miles up the road. 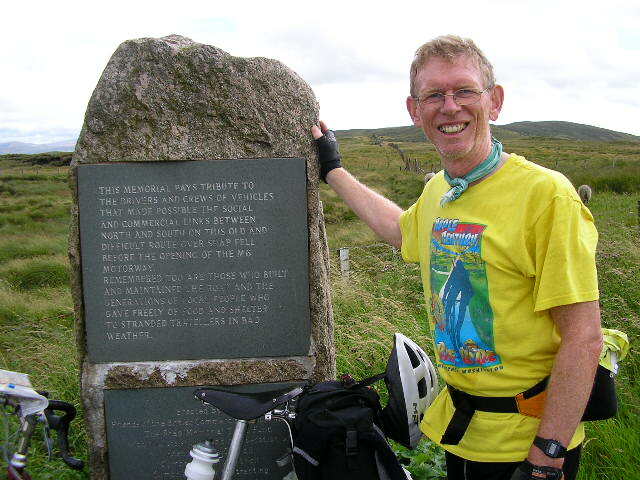 Since her death, Prince Charles and Camilla have continued the tradition of taking a summer break there, and he not only attended the Mey Games the day of my arrival, but he also attended Sunday worship at Canisbay Church while I was pedalling in the Orkneys. I seldom re-visit routes I’ve done in the past. My attitude has always been that there are too many new and exciting routes to explore to allow time for repeating rides. However, I am really pleased I repeated this most iconic of routes just a couple of weeks after retiring from a career of teaching. A change of direction in life is frequently heralded by a landmark experience, and it was nice to know that, 26 years after my first attempt, I could cover the same distance with 2 days to spare. My decision to do the route was very last minute. 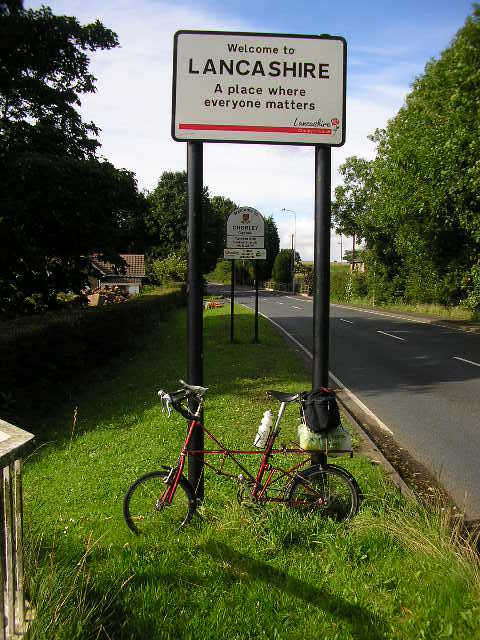 The only planning was to buy a couple of train tickets, tear a few pages from a cheap road atlas and trace my route, pack my saddlebag, dismantle the Moulton to pack into the two bags, and go. In total, about half a day’s preparation. Most of those I had met en route had spent months, even years, planning their expeditions. If you are generally cycling fit, little fitness preparation is required. Just pack a few necessaries and go and do it! You won’t regret it.